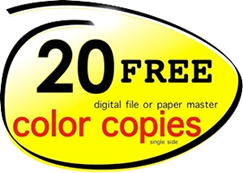 Quick Printing – Sheet fed color or black and white. Sizes up to 13 X 19 paper weights up to 16 pt card stock. Post/Rack Cards – 3 X 5 up to 11 X 17 Coated or uncoated stock up to 16pt. Laminating – Roll up to 24' wide, pouch up to 11 X 17. On-Site file storage for repeat documents for up to 1 year at no charge.